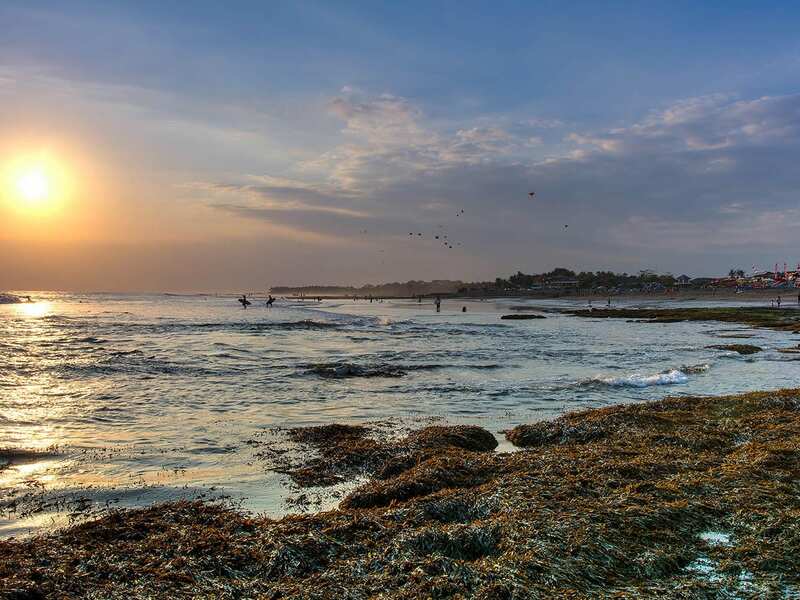 Set just steps from the Indian Ocean in Seseh, a quiet fishing village on Bali’s southwestern coast, Seseh Beach Villa II offers plenty of privacy and seaside serenity. Featuring contemporary architecture and furnishings, al fresco areas for dining and socialising, a 14-metre private pool and six spacious bedrooms with ocean views including a children’s room with four bunk beds, this is the perfect beachfront haven for families and groups who want to escape the hustle and bustle of city life. 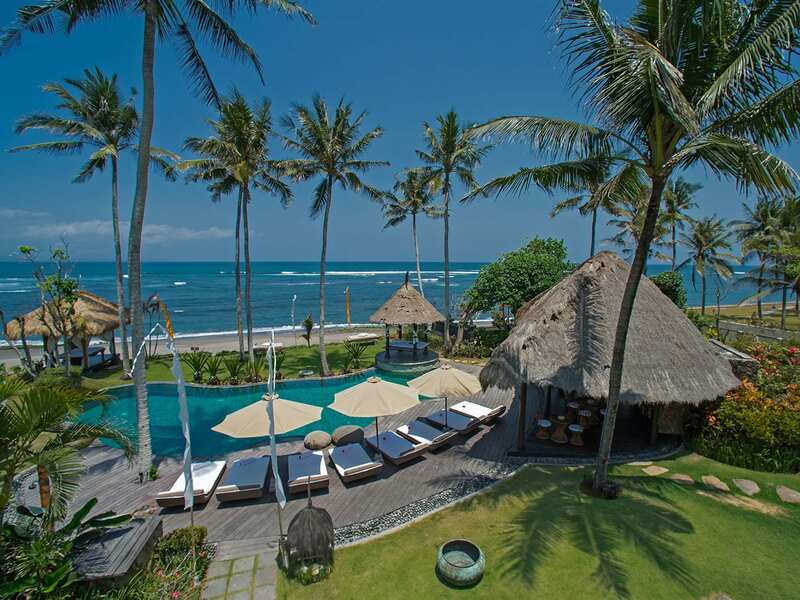 Seseh Beach Villa II can also be rented jointly with Seseh Beach Villa I next door to create a stunning beachside venue for weddings and special events. 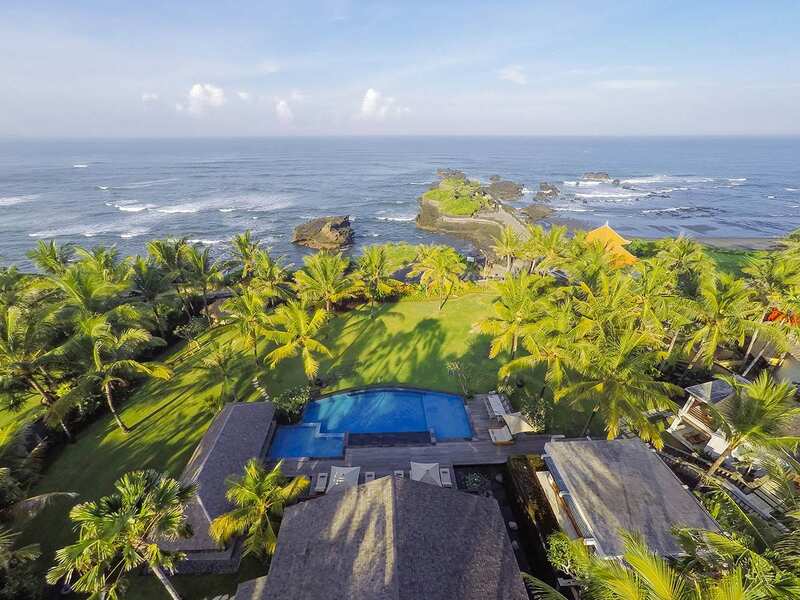 Far from the madding crowds of South Bali, yet just a car ride away from the Nirwana Bali Golf Course, Tanah Lot temple, Canggu and Seminyak, Seseh Beach Villa II is a alluring seaside sanctuary surrounded by tropical trees and fronted by the ocean. 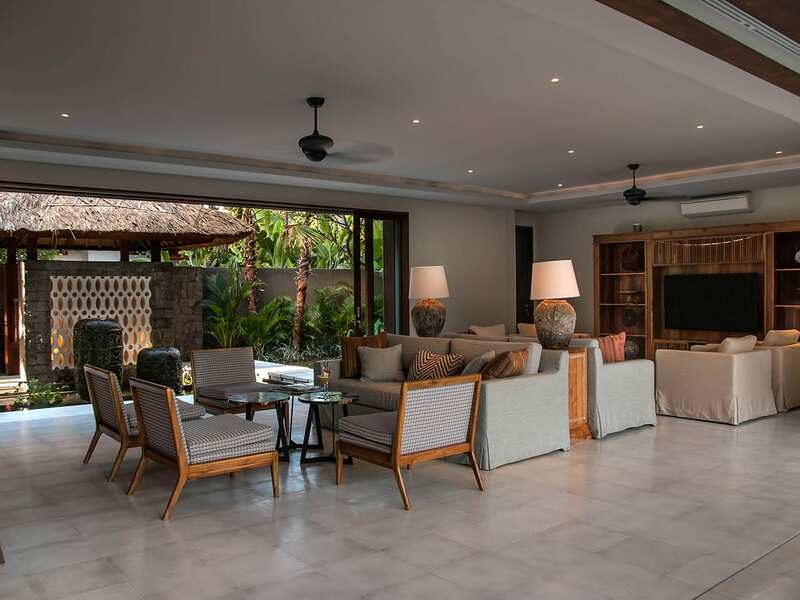 Clean white lines contrast beautifully with tropical touches like thatched roofs and teak accents, while floor-to-ceiling windows and doors open to let in the sound of waves crashing on the beach. 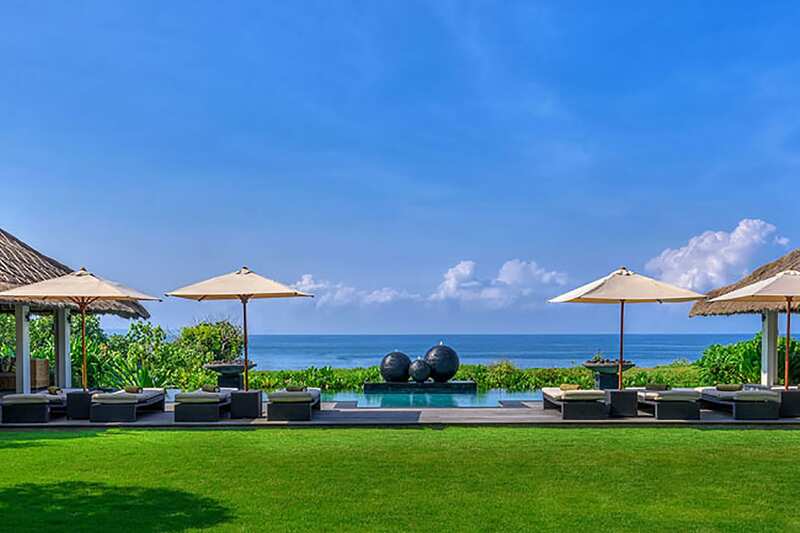 There are six stunning bedrooms to choose from here, some offering ocean views, and the large lawn, pool and open-sided pavilions are perfect for rest and relaxation or group gatherings. 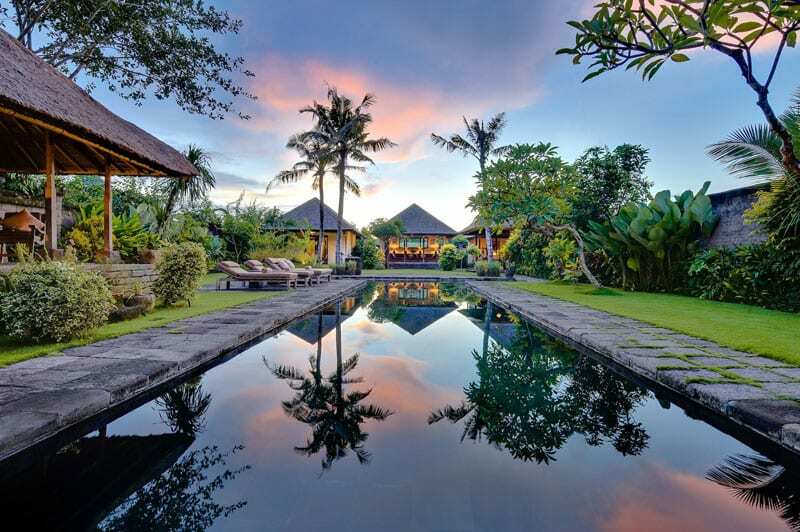 Adding to its appeal, the villa is fully staffed with a villa manager, private chef, villa attendants and a 24-hour security team. 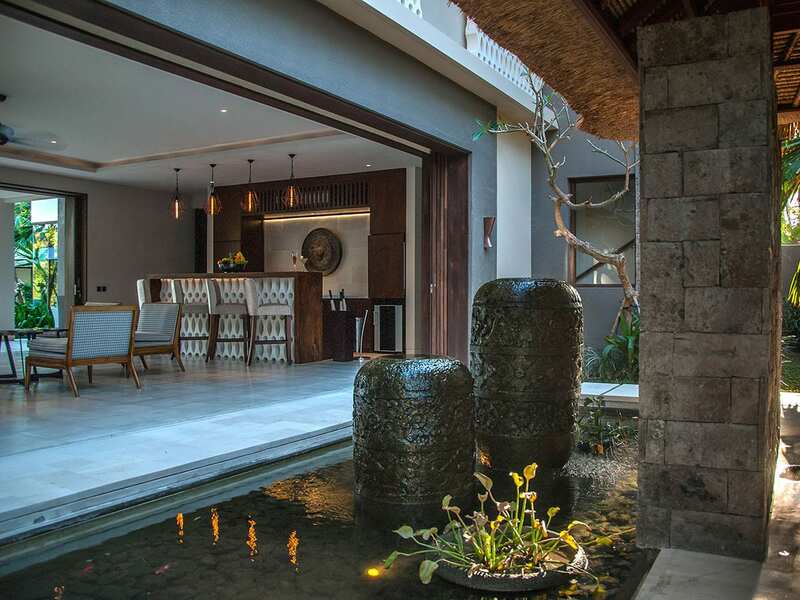 Follow a stepping stone path over a fish pond and through a porte cochère and you enter Seseh Beach Villa II’s spacious living room. Glass doors open on either side for a partial al fresco experience, or they can be closed for cool air-conditioned comfort. The living room boasts two two sitting areas, one with comfortable sofas and armchairs in front of a 65-inch TV, and another in front of a stylish bar with a stonework facade. On the other side of the living room there is a formal dining room with a table for 14 under a chandelier, as well as a staircase leading to the villa’s upper level. The sliding glass doors on the garden side open to a covered terrace overlooking the garden and pool. 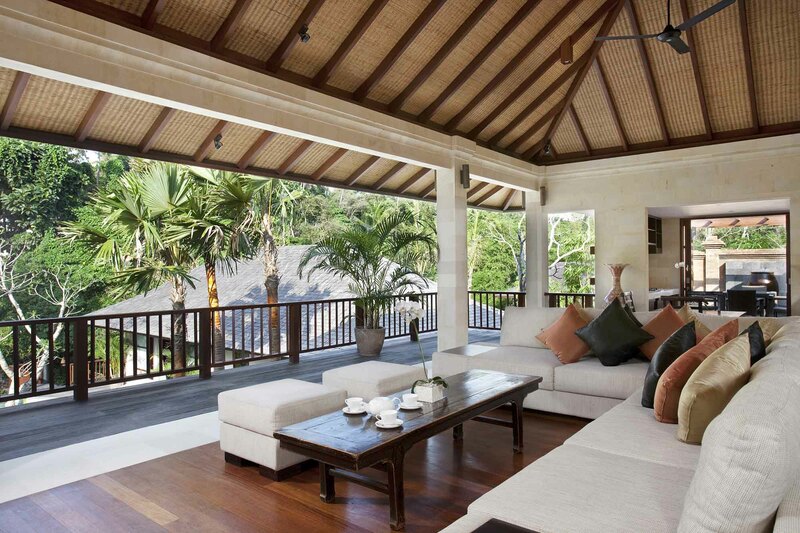 The two master suites at Seseh Beach Villa II are located on either opposite ends of the upper floor of the villa. Both have soaring ceilings, four-poster king-sized beds, and shaded balconies that offer views of the garden, pool and ocean beyond. The suites also have modern conveniences like flat-screen TVs with DVD players, iPod docks and Wi-Fi, as well as walk-through dressing rooms that lead to air-conditioned bathrooms with freestanding bathtubs built for two, twin washbasins and glass-enclosed monsoon showers that are partially open to the skies. 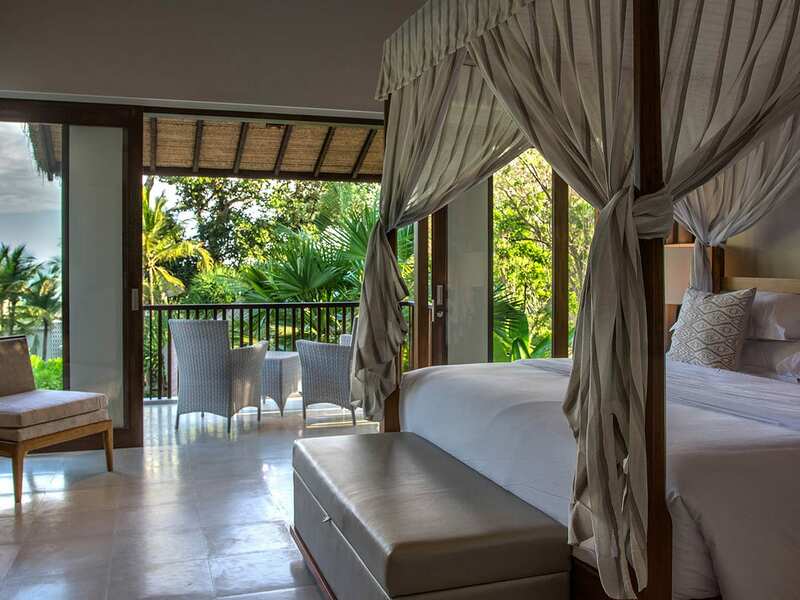 Seseh Beach Villa II offers three guest suites, two upstairs and one downstairs, plus a children’s bedroom on the ground floor. The rooms are similar in size and feature king-sized beds, 39-inch satellite TVs, and tasteful textiles and furnishings. The bedrooms upstairs have sliding glass doors that open to a beautiful communal patio with sofas, soft chairs and coffee tables, while the bedroom downstairs has a glass door that opens to a private terrace. 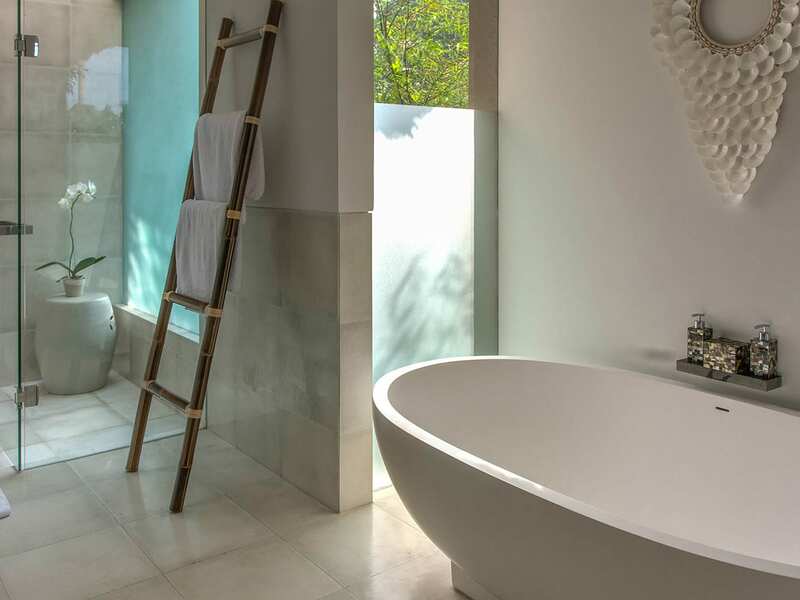 All rooms have ensuite bathrooms with bathtubs and walk-in showers, and the downstairs room has a lovely outdoor shower. The children’s room is perfect for young people and the young at heart, as it has four bunk beds built into the walls, beanbag chairs and an attached bathroom with a rain shower. 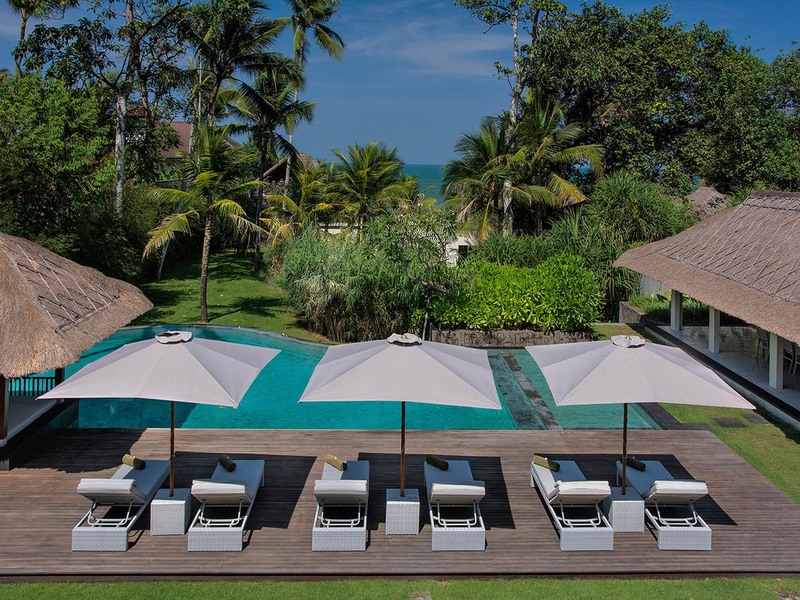 There are plenty of places to enjoy the tropical weather and sounds of the sea at Seseh Beach Villa II, the most striking of which is the 14-metre pool with its shallow area for children and free form shape. 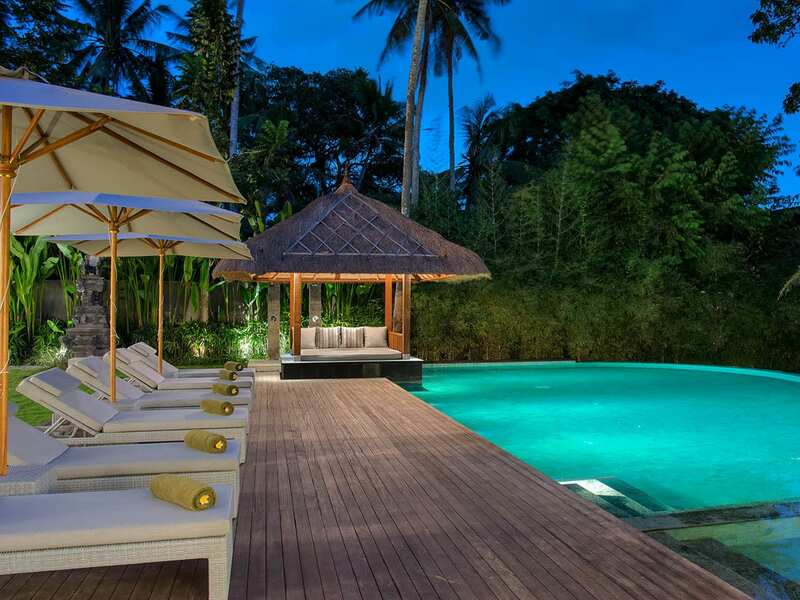 The pool is fronted by lush greenery and backed by a timber deck with sun loungers and umbrellas, and it has a relaxation bale on one side with soft cushions and a mattress. 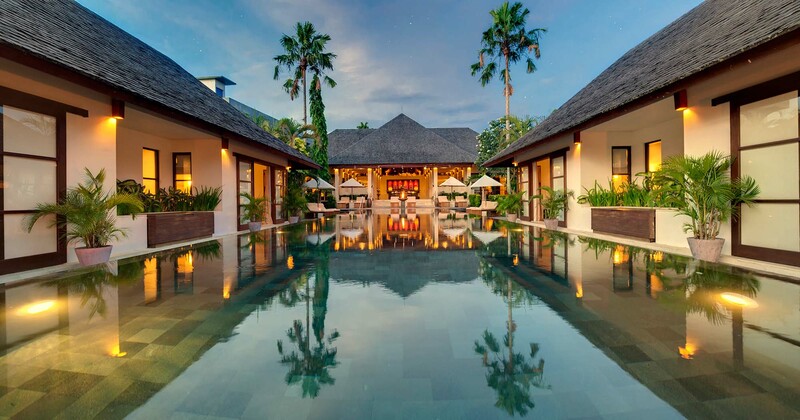 On one side of the pool there is an open-sided dining pavilion with a thatched roof, table for 12, and two guest washrooms. 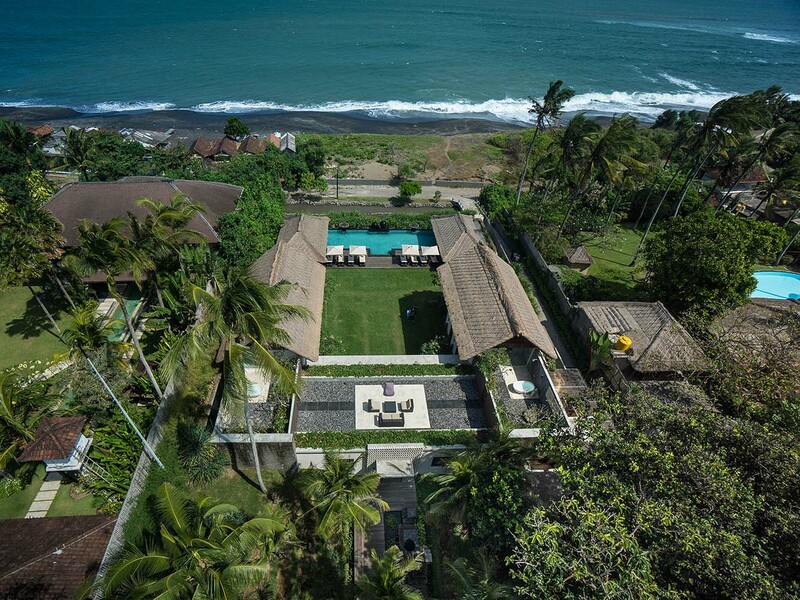 The spacious lawn and garden is the ideal spot for parties under the sun and stars, and it has a discreet gateway that connects it with Seseh Beach Villa I. CAPACITY 10 adults and 4 children (5 ensuite bedrooms with king-size beds, 3 of which is convertible to twin beds, plus 1 kids’ bedroom with 4 bunk beds). 2 extra beds may be set up on request (additional charge). LIVING AREAS Living room with TV area; indoor dining for 14; outdoor dining for 12; poolside relaxation balé. POOL 14 x 6.5 metres. STAFF Shared between Seseh Beach Villas I and II are a villa manager; private chef; villa attendants; security; gardener and maintenance team. Additional staff (babysitters, masseuses) available on request. DINING Western, Asian, vegetarian, healthy choice and children’s dishes available. Requests accommodated (including special diets and barbecues). ENTERTAINMENT TVs in all rooms including living room and bedrooms; DVD player; surround sound; iPod docks in each room (Bluetooth or cable through Sonos system; Xbox; PlayStation. 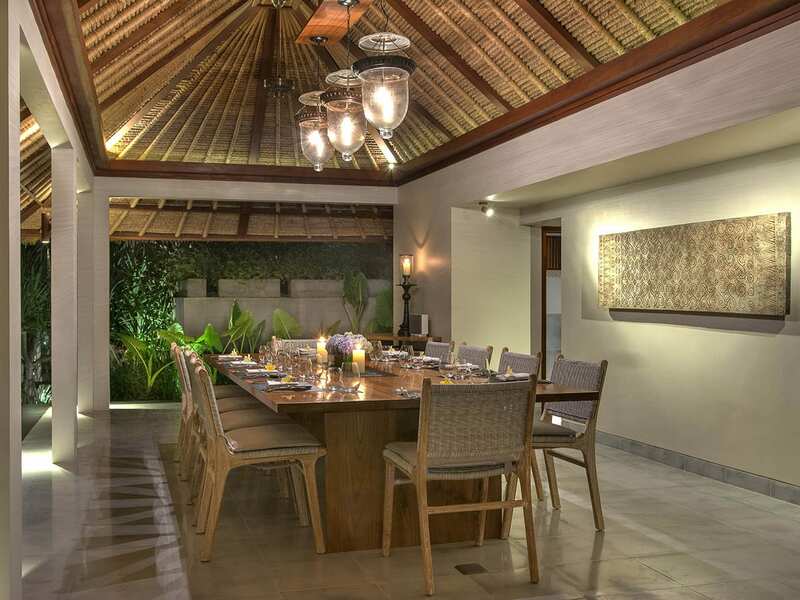 FOR FAMILIES Seseh Beach Villas are well equipped for families. Facilities include a baby cot and high chair, PlayStation, Xbox and Wii. TRANSPORT The villa offers one 7-seat car available for guest use for 8 hours a day, excluding petrol. Additional transport can be organised by your villa manager if required (additional cost). ADDITIONAL Barbecue; diesel powered back-up generator; safety deposit box. PROPERTY AREA 2000 sqm (land). 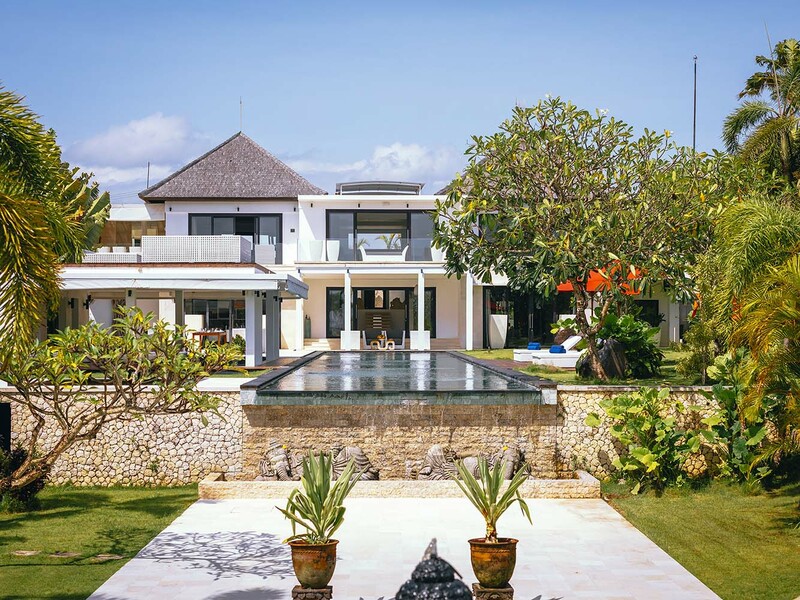 Secluded, serene & super spacious, Villa Belong Dua gives you a taste of Balinese heritage while still providing you with 21st century comforts. 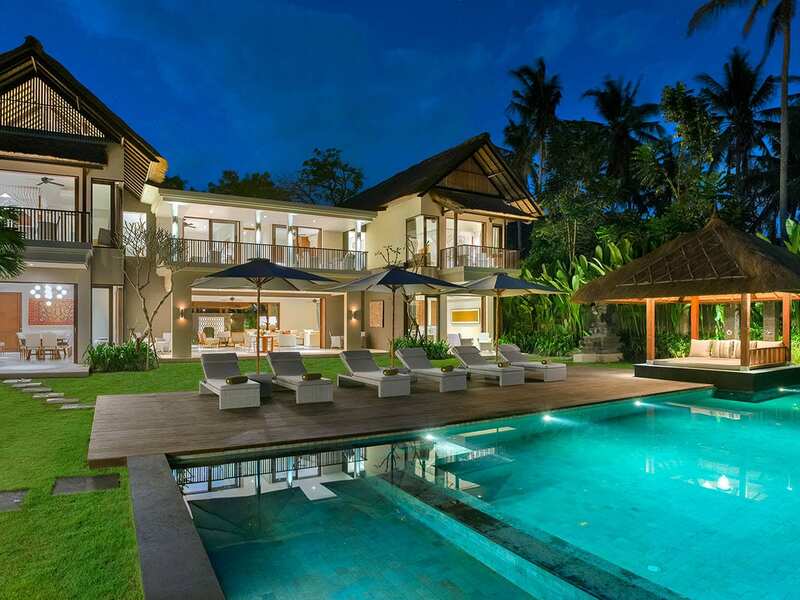 This enchanting 2-bedroom villa is located on the island’s south-west coast. Sleeps up to 4 Guests.